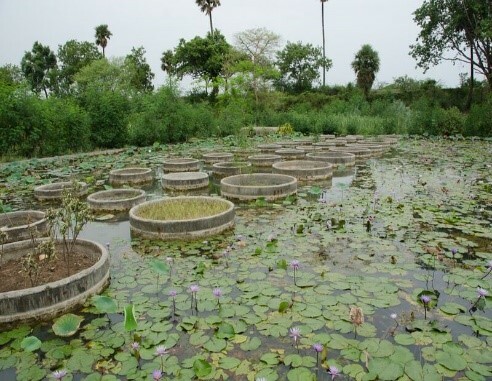 Dharma Vana Arboretum (DVA) is under development in the Bhongir mandal, District Nalgonda, Telangana. It is being established to conserve the biodiversity of woody flora found throughout the Deccan Plateau and Eastern Ghats in India. The DVA spreads over an area of 455 acres near Hyderabad and is the largest botanic park focused on tropical dry flora worldwide. Dharma Vana Arboretum is a biodiversity conservation project for tropical dryland flora facing pressures from increasing human and livestock populations. Loss of this biodiversity results in degradation of fragile ecosystem and economic hardship to the poor communities dependent on this ecosystem for their subsistence. Situated just outside of Hyderabad, the landscape is a pristine example of un-spoilt Deccan geology. The main emphasis of the project is on conserving rare and endangered species of native trees and shrubs of the Peninsular India in a ‘wild’ setting. The long-term goal of this project is to re-establish an ecosystem suitable to dry tropical flora and complementary native fauna with over fifty thousand woody plants. While in its early stage of development, DVA serves the local community (Bhongir town and neighboring villages) with all the benefits of an emerging ‘Green lung’, significant water conservation works, and youth employment. IDRF is funding part construction of infrastructure and facilities of the arboretum that is scheduled to be partially opened to public by 2020 for education, research and enjoyment of nature. Please click on the links to know more about Dharma Vana Arboretum project. On a bright, sunny and cool day in December 2017 in Hyderabad, our small group was given an up-close and personal tour of Dharma Vana Arboretum by the founder and the heart and soul of the organization, Mr. Fred Durr. DVA is a non-profit society that emphasizes nature, environment and its sustenance through biodiversity conservation. In short, it’s all about ecosystem restoration. Located in the heart of India on the outskirts of Hyderabad in Bhongir, it is an expanse of 450 acres dedicated to the conservation of trees and shrubs of arid zone regions worldwide. The land exhibits several microclimates with their respective flora and fauna on natural vistas of hillocks and rock formations typical of the semi-arid Deccan Plateau region. Seeing the park through the founder’s fertile mind, we were blown away by his imagination, creativity and just plain hard work for his life’ passion. He painstakingly researched plants and brought the best specimens from growers and would spend many days in Indian forests at the time of the seed formation to collect them before the forest creatures would! He then nurtured them in a several acre nursery where he invented and built machinery to grind up coconut husks for compost which was used to bring health back to the land. He even offered the compost to the city municipality! The plan for the Arboretum calls for discrete areas to showcase different flora and areas to represent major religions with sculptures created by the founder himself. These can be used as places for meditation in the years to come. Since it is becoming increasingly difficult for the general public to access India’s forests, many of the wild tree species planted at the DVA would serve as a major showcase of true representatives of the jungles. The arboretum can be integral to teaching respect for forests and even function as a seed bank for replenishing wild flora as the need arises. Mr. Durr’s dedication and the amazing way in which he manages the intricacies of India’s myriad regulations just makes me even more certain of the fruition of his dream!